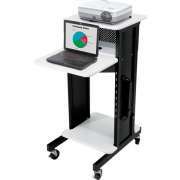 Why should you get a computer cart? 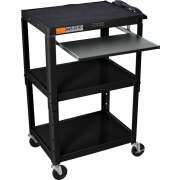 Mobile computer carts are not only convenient, they also help preserve valuable equipment and prevent employee injuries. Hertz Furniture&apos;s computer carts, laptop carts and AV carts are your solution for safe and accessible computer work spaces. 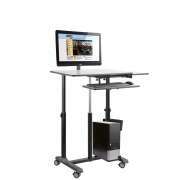 Increase the versatility of your computer and benefit from easy mobility with our large variety of PC carts. All of our models are designed for your convenience and are available at affordable prices. With functional computer stands you can take a comfortable workspace anywhere. What kind of standing computer desk will fit my computer? Computers come in a number of different styles, so your computer cart selection should be determined based on which kind you want to support. We have models that are designed specifically for laptops, full-size desktops and flat screen computers. 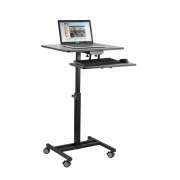 Our adjustable-height laptop stands are great for teachers and lecturers who want to look at their laptops while they are speaking in public. 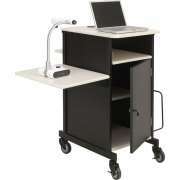 Laptop desks aren&apos;t just about convenience, they can also have a huge impact on health and comfort. If they are constantly bending down, professionals can easily develop debilitating back pain or even serious medical conditions that require surgery. When a laptop screen is set at a comfortable viewing angle, people don&apos;t have to bend down to see a clear picture. Many of our computer stands have adjustable height so everyone can find the perfect adjustment for a comfortable user experience. How can I accommodate people of different sizes in the office? 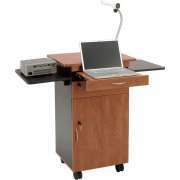 Adjustable-height laptop desks are ideal for a setting where multiple people need to use the same computer. When a lot of people need to work in the same space, it&apos;s hard to find a height that is comfortable for everyone. 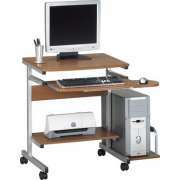 With a pneumatic gas lift, the height of a computer cart can be adjusted smoothly and easily so anyone who uses the computer can type and view the screen at a comfortable height. What will fit on a standing computer desk? 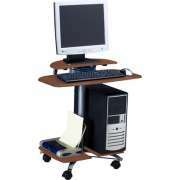 All desktop computers have multiple components that a computer cart needs to support. Our standing computer desks are designed to hold monitors and CPUs in an appropriate position for easy-access and work. Some even have pull-out keyboard trays and spaces for printers. If you want to be able to take written notes or use reference materials as you work at the computer it is important to make sure that there is some extra work surface space on your computer cart. Need a place to keep extra monitors, CPUs and accessories? Looking for the easiest way to manage a network? LAN racks are strong enough to support heavy equipment securely. This convenient arrangement enables you to keep everything you need in one place so it is easy to manage a network. Alternatively, a LAN station can be used to store extra desktop components. Rather than stacking everything in a storage closet where it might get knocked over or on shelves that may not be strong enough to hold it, you can find a stable place for multiple monitors, CPUs and more on the LAN rack. What should I look for in a computer stand? 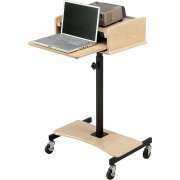 If you are going to use your mobile computer cart as a portable computer desk, it is important to make sure that at least two of the casters can be locked. 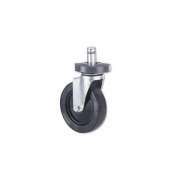 Locking casters keep carts securely in place so they won&apos;t move around while people are working. Extra shelving is convenient to have if you want to keep a lot of extra accessories with your computer in addition to the basic necessities. How can I bring technology into the classroom? Computer carts are useful to have in just about any setting. 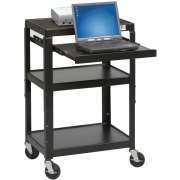 When you have computer carts in schools, it&apos;s easy to bring technology into the classroom. This arrangement enables you to share desktops among a number of classes, so you don&apos;t have to purchase separate computers for each classroom. In a professional setting, it is always helpful to have a backup computer or additional workspace around just in case an extra standing computer desk is temporarily needed. 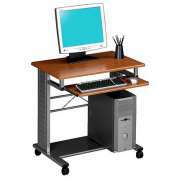 Computer stands enable you to relocate easily without having to carry heavy equipment and furniture. 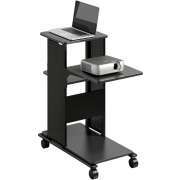 When you are giving company presentations or digital slide shows at school assemblies, AV carts can really come in handy. These versatile pieces can support a computer and a slide projector so you can keep all presentation equipment in one place. With this arrangement, you only need one person to keep a digital presentation running, rather than having to use multiple pieces of equipment or coordinate amongst a number of facilitators. 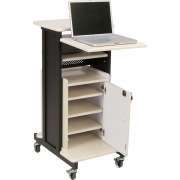 Hertz Furniture&apos;s computer carts come from reliable manufacturers who specialize in technological equipment including Mayline, OFM and Balt. They provide mobile workspaces so you can take an appropriate computer desk anywhere. With great laptop desks, computer carts and LAN stations, it is much easier to be productive throughout the workday.